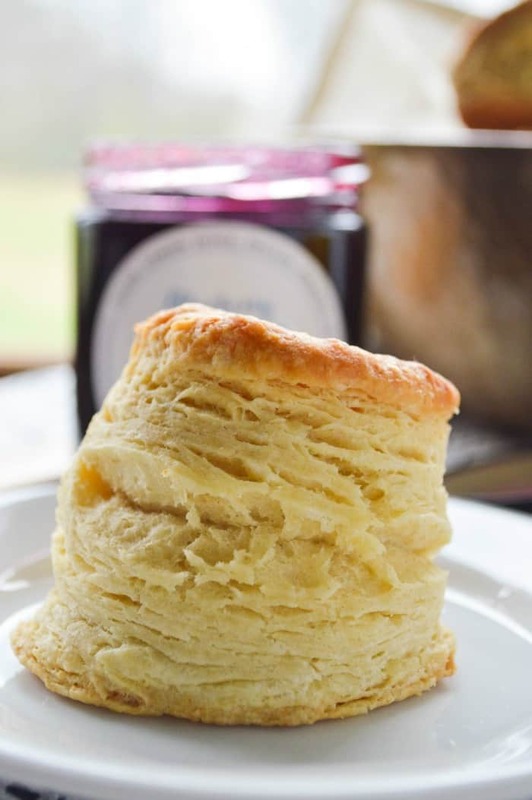 The Biggest Fattest Fluffiest All Butter Biscuits are a testament to buttery, flaky biscuit layers that pull apart better than any biscuits you will ever pop out of a can! 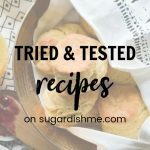 I’m going to show you the combo of ingredients plus technique plus tips and tricks that yield amazing biscuits every time! I’ve talked about biscuits a lot here because for years I COULD NOT MAKE THEM. My husband’s grandma is biscuit pro and I have definitely written about my ineptitude in following her “little a this little a that” grandma directions more than once. But this time I have really done it. REALLY. I have made the Biggest Fattest Fluffiest All Butter Biscuits there are. And I am going to teach you how! Going waaaay back to November 2012, I made these Honey Butter Glazed Whole Wheat Biscuits. They are earthy and so so good, but what I really borrowed from that recipe is the technique. What makes these the biggest, fattest, fluffiest all butter biscuits is how you pat out the dough. Those flaky layers didn’t come from a can! Once your ingredients are combined and you have kneaded things in the bowl to pick up any spare dry bits, you are going to turn the dough out onto a WELL FLOURED counter. Flour your hands and pat the dough out into a big ‘ol rectangle. THEN! You are going to fold the short sides of the rectangle in so they meet in the middle. Pat that dough back out into a rectangle and repeat this SIX TIMES. Yes, six. When you pat the dough out into a rectangle the 7th time, you are ready to cut out your biscuits. First and foremost! You need the ingredients to be COLD. The recipe specifies cold butter because it totally makes a difference. After I cut the butter into the flour mixture I will often stick the bowl in the refrigerator for some extra chill time while the oven preheats and I prepare my well-floured work space. Don’t add all the liquid at once. 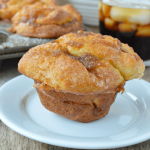 This recipe calls for 2 cups COLD buttermilk (regular milk will also do! DO NOT use less than 2% fat content though. That makes sad biscuits.). Start by adding just 1 1/2 cups. Combine and see where you are at with texture. Then add the remaining milk a little at a time. This can vary every time you make this recipe depending on how you measure your flour, the humidity in the air, etc. So it’s important. RE-FLOUR. Once you are working through your pat-and-fold process, you will need to keep your flour handy. Scatter a little more under the dough as you work and re-flour your hands. It’ll make your biscuit life easier. Promise. Big fat fluffy biscuits! You can do this. I have this set of biscuit cutters . That gives me a whole range of different sizes and I use them for all kinds of different things. 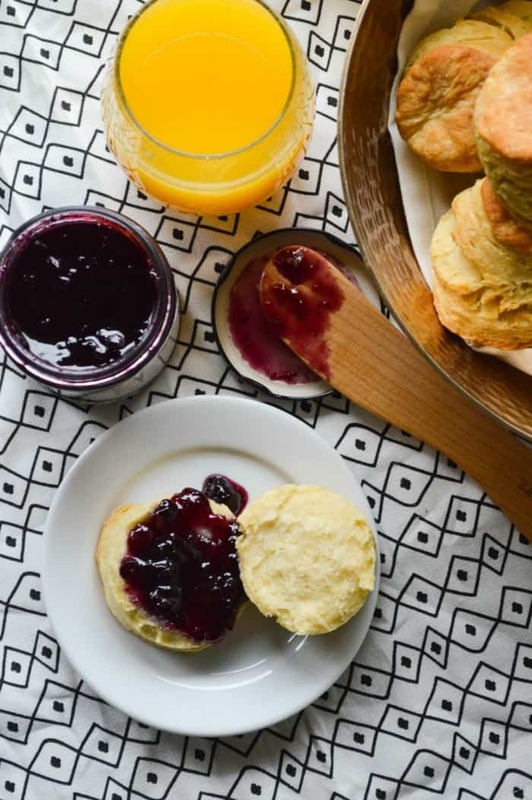 Cookies, biscuits, scones, pie crust – all kinds of stuff. You don’t need a fancy cutter though; you can flour a juice glass! I spent a LOT of years with zero kitchen tools and am semi-professional at making it work with no extra anything. If you are wondering about this dreamy jam … it’s from my friend Madeleine Dee at Fond Originals. She makes all of these goodies that you can purchase via her Etsy Store, but if you are in the Louisville area she actually has a restaurant. I am dying to go. This is BLUEBERRY LEMON JAM and I am in love with it. I am sure it will make another appearance here soon. So now you are going to print the recipe for the biggest, fattest, fluffiest all butter biscuits. AND THEN I really hope you’ll tag me on Instagram or find me on Facebook and tell me about your biscuit successes. That’s pretty much my favorite thing ever. 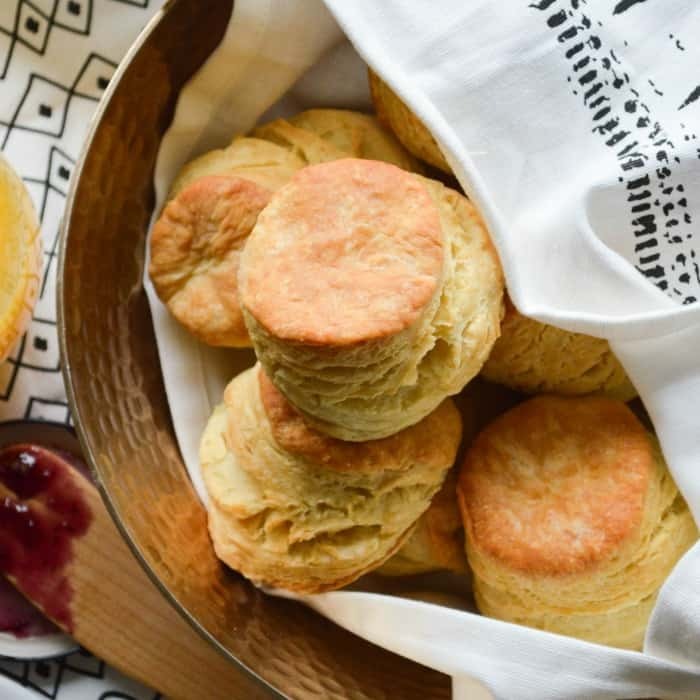 The Biggest fattest Fluffiest All Butter Biscuits are everything you ever wanted in a homemade biscuit recipe. Flaky tender layers, butter, and perfectly browned tops. The height on these babies is ridiculous. Preheat the oven to 425°F. Set out an un-greased baking sheet. Lining with parchment paper is optional. In a large bowl whisk together the flour, baking powder, baking soda, sugar, and salt. Cut in the COLD butter using a pastry cutter OR a fork OR your hands. Method used is your preference! You’ll know it’s good when coarse crumbs have formed and if you grab up a fistful it sticks together pretty well. Gently fold in the buttermilk with a rubber spatula or wooden spoon. Generously flour a clean work surface and keep your flour nearby to dust your hands and the dough regularly. Knead the dough a bit in the bowl — it will be VERY wet and sticky!! Just do your best and make sure to incorporate any dry bits from the bottom of the bowl. Turn the dough out onto your prepared surface, flour your hands, and knead it a few times. It will get easier to work with. Pat it out into an oblong oval shape that’s about an inch thick. Fold the short sides toward the middle. This is what gives your finished biscuits their “layered” texture. Smack the folded dough down and press it back out into the oval shape. Repeat this process a total of 7 times, but on the 7th time, skip the folding and get ready to cut out your biscuits. Cut your biscuits out into 2 - 2.5" circles. If your size varies the bake time may change. Space the biscuits an inch or two apart on your prepared baking sheet. Optional: brush the tops with melted butter as soon as the biscuits come out of the oven. I have other biscuit recipes! These Apple Biscuits with Honey Butter Glaze are my favorite way to use up bruised apples. 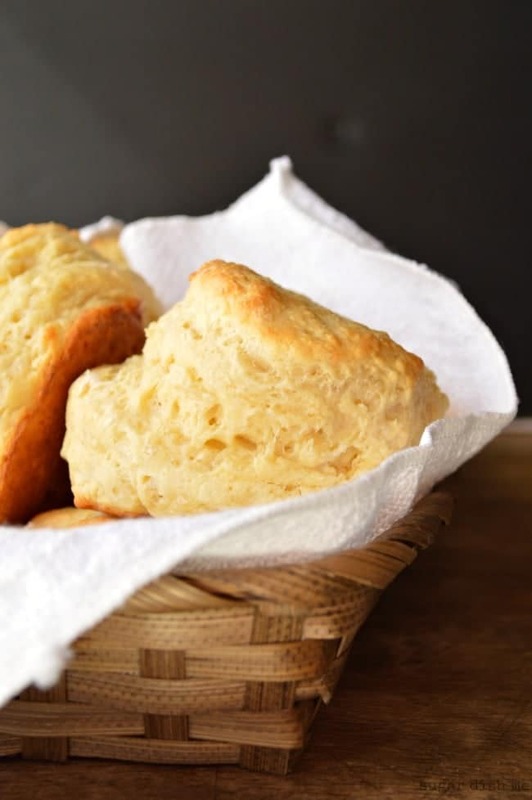 Greek Yogurt Cheddar Biscuits are lower in calorie and are ALSO big and fat and fluffy. If you want to try something that’s not all butter I HIGHLY recommend these. 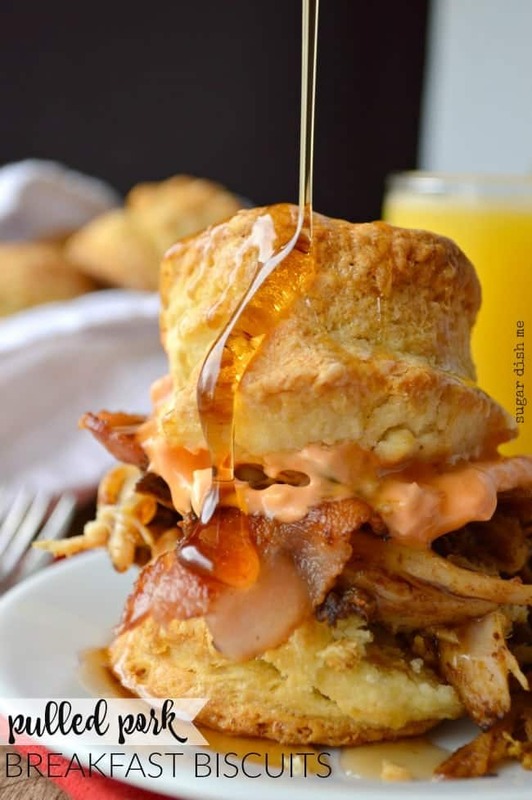 And if you needs something that’s just incredibly decadent these Pulled Pork Breakfast Biscuits are your best bet. They were inspired by a giant thing my husband ordered in a restaurant and are so southern and delicious and WORTH IT. Just made these for dinner tonight and all I can say is WOW! I have never had biscuits rise up so tall and flaky! I only made a half batch since it’s just the two of us but now I’m wishing I had made the full batch to have some for breakfast in the morning lol. Definitely will be making these again! 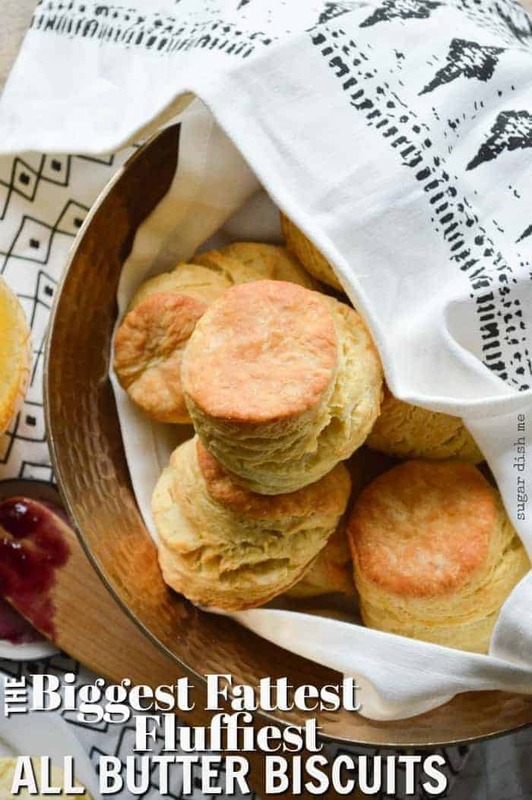 Can these biscuits be made ahead, baked, then packaged frozen, and defrosted day of serving? I have never tried it! But if it works for you I would LOVE to know! You are also welcome to email me at sugardishme@gmail.com. 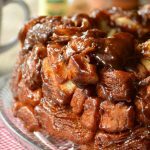 I made these a day ahead, had them cut and in the fridge overnight–they came out terrible! They were like hockey pucks and the flavor was not good. I was having guests for a brunch and I was so disappointed. Making them a day ahead was definitely not in the instructions, Sam. Can self-rising flour be used and just add the sugar to it for the dry ingredients? White Lilly self-rising flour is a staple in the South and i thought just adding the sugar to it would work, unless you think it would need extra baking powder or soda. 3. Keeping the ingredients COLD. If you test out White Lilly before me please let me know how it works for you! All my life my homemade biscuits have turned out like hokey pucks, no matter how much the recipe touted the lightest fluffiest results. So I was skeptical when I read your recipe. Last night I made the biscuits and was blown away!!! Those babies were three inches tall and pulled apart in layers, just as you promised. I bragged about them all day and my co-workers asked for the recipe. I promised to share. I can’t thank you enough for giving me the confidence to make great biscuits, for the first time in my life. Can shortening be used as a substitute instead of butter? Or does the butter make them exclusively fluffy? Oh my! Tall, beautiful and golden!! 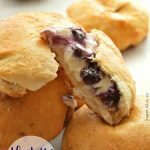 I’ve tried many biscuit recipes and this is by far the best and only one that came out perfect. 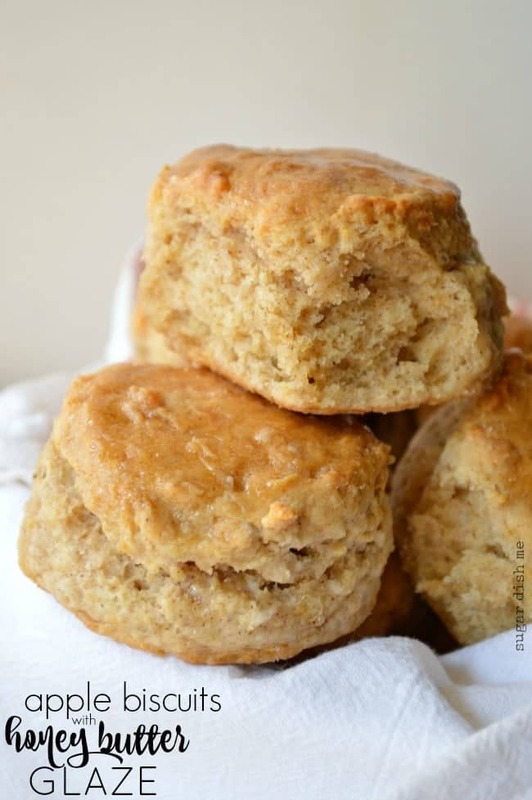 I’m divorcing all of my other biscuit recipes and sticking with this one 4-ever! I’ve made these twice and both times they were sensational, they are the lightest and fluffiest biscuits I’ve ever made. 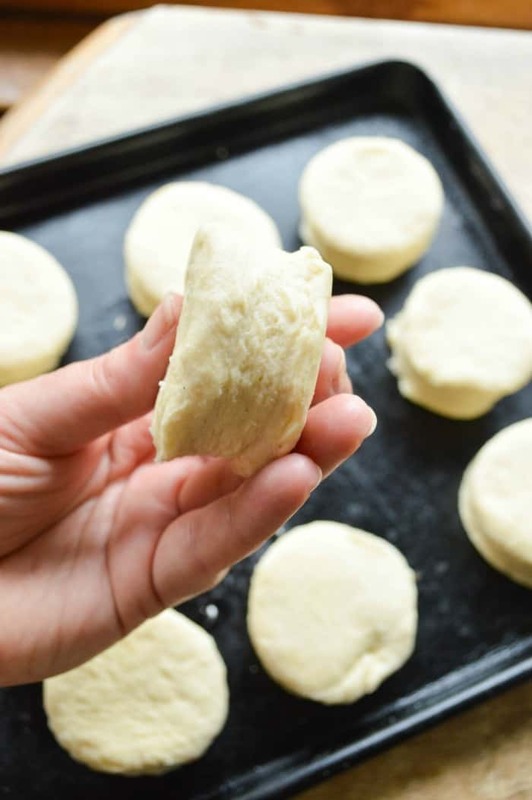 The fold over method is easy and is key to fluffy biscuits. I halved the recipe, but otherwise followed the recipe exactly. 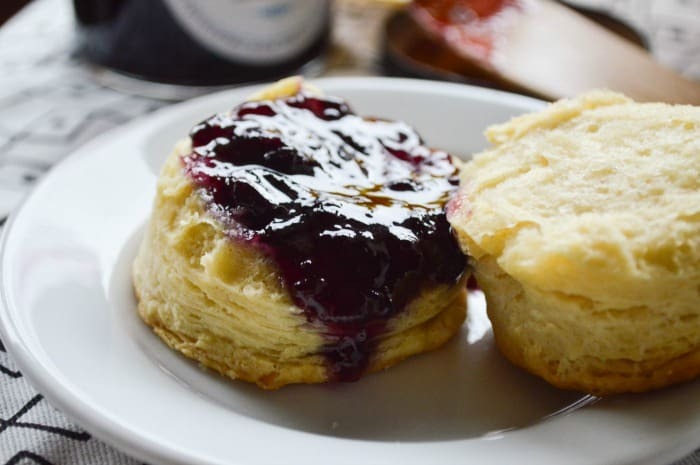 These are the best homemade biscuits I’ve ever made, and I’ve tried many recipes! Thank you so much, Sheila! What a wonderful compliment! Can’t wait to use your recipe, but, when making bisquits I always use a cheese grater for the butter, it works really well. Why do some recipes say to space the biscuits and others say they must touch? Depends on the recipe!If you want to pull them apart then you’d want them to touch in the pan. These are super tall and if you bake them so they are touching you’d need to pull them apart 2 ways. Would be nice if there was something about how thick the dough should be flattened before cutting the biscuits. I took a guess and it was not right. My biscuits are flaky but not nearly as tall, and thankfully I thought to check them around the 15 minute mark because they were already over done, by 20 they would have been burning. Hey Monica — it DOES specify: “Pat it out into an oblong oval shape that’s about an inch thick. Fold the short sides toward the middle. This is what gives your finished biscuits their “layered” texture. Smack the folded dough down and press it back out into the oval shape. 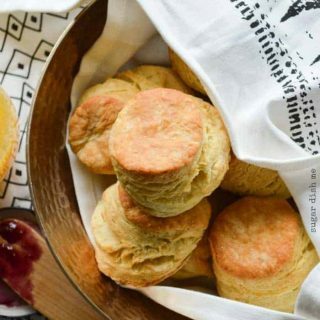 Repeat this process a total of 7 times, but on the 7th time, skip the folding and get ready to cut out your biscuits.” I’ve never had this recipe fail me, and it’s never gotten a bad review! It’s been REALLY thoroughly tested. Terribly sorry about that, I read it as that it should be an inch thick before folding each time since it was well before the directions about cutting them out. And if you noticed, I did say they still came out flaky, just not quite as tall. I wasn’t saying they didn’t come out good, just that the directions were suddenly lacking information at an important part. Hi Monica! No apologies needed! I really just want to make sure they come out for you!